How superior is Pulsar RS 200? Almost every young person in India aspires to have a sports bike and that is why this is perhaps the most rapidly growing segment in the Indian auto market. Also, with the exponential growth in the number of wealthy buyers, demand for the high capacity bikes is set on fast track. In such a shift, 200cc bikes are most popular as they strike a balance between performance and daily use. So, more and more manufacturers are trying their luck in this segment. Among the strong contenders in this segment are RC 200 and recently introduced Pulsar RS 200. In this article we have compared both these bikes to see which one is superior. Both the bikes are powered by 199.5 cc single cylinder engines. In fact, the engine of Pulsar RS 200 is developed with the help of KTM. In addition to the valuable input from KTM, this engine employs Bajaj’s patented technology of triple spark ignition. To improve performance and to meet the emission standards, these engines are liquid cooled and they employ fuel injection technology. In terms of power output, RC 200 manages to churn out 1 kW of additional power compared to RS 200. On the transmission front, a six speed gearbox is standard fitment on both. Pulsar RS 200 has a larger belly i.e. 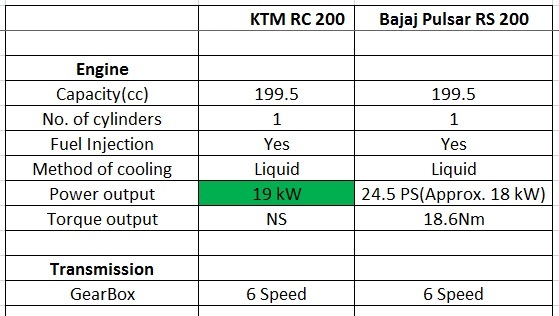 fuel tank (packing 3 litres more) in comparison with KTM RC 200- an advantage for the long runs. To offer a comfortable ride and to maintain the ‘sports status’, RS 200 and RC 200 both are accoutred with telescopic forks at front and monoshock suspension at rear. To control these high speed beasts, disc brakes are a standard fitment on both the wheels. In taking safety a step ahead, Bajaj has offered ABS on the front wheel of RS 200- clearly an advantage over its rivals. Among the dimensions, one of the most important is wheelbase which is comparable on both the bikes. However, KTM has managed to offer a higher ground clearance on RC 200 (almost 22mm more than Pulsar RS 200) which is certainly beneficial on Indian roads. In the world of speed, the golden rule is- ‘lighter the faster’! And again in this regard, RC 200 takes a lead on its competitor Pulsar RS 200. Indian market being very sensitive to price, Bajaj has put a lighter price tag on Pulsar RS 200. And here it clearly proves economical to buy than its rival KTM RC 200. In conclusion, it is seen that both these bikes have their own strengths and weaknesses and technically they are at par with each other. So, the user is advised to choose one based on his budget and style preferences! Home » Articles » How superior is Pulsar RS 200? Tata Impact 2.0 design: Is it really a game changer? CBU, CKD, SKD: What are these Manufacturing Processes?